One of the Northern Short-tailed type. Originated from Old Norwegian with Icelandic and Faeroes blood. Raised primarily for meat and wool production. 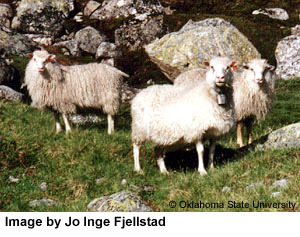 Wool is usually white but the breed does have individuals with colored wool. Individuals can be either polled or horned. The adult ewes reach a live weight of 60-70 kg. Mason, I.L. 1996. World Dictionary of Livestock Breeds, Types and Varieties. Fourth Edition. C.A.B International. 273 pp.